There's not much I love more than a spa day/evening/weekend so I was of course, so happy when I was asked to spend a day at Danesfield House Spa Illuminata to review their facilities and treatments it was like all my Christmases had come at once. They kindly let me bring a guest so I took Jenny from Dream In Pink. This stunning country house is surrounded by 65 acres of landscaped gardens and parkland. The Terrace doors' unveil the private grounds with the River Thames as backdrop. Walk around and discover the Italian and water gardens, tennis court and croquet lawn. The Grade II listed house was completed in 1901. 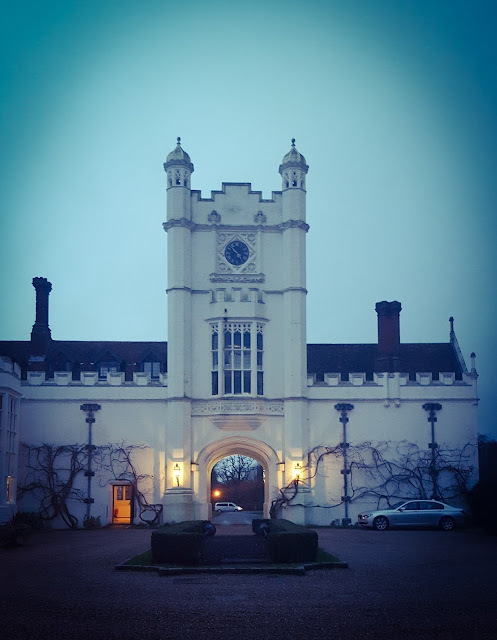 I have used Danesfield House previously for corporate events but as with any event work, I have never had time to check out their spa. I'd also had a long week at work so a spa day was exactly what I needed. We arrived to a tree lined driveway and a stunning clock tower entrance. It was such a shame the weather wasn't better as this photo would have been perfect with clear blue sky. Upon entering the spa we were given a locker key which had slippers, a gown and a towel in. A small gesture, but a lovely one at that. We headed straight out on to pool side but unfortunately there weren't any free beds to lay on - I guess everyone had the same idea as us of a relaxing Sunday spa day! Undeterred we spent some time in the steam room, the swimming pool and then the jacuzzi where we really begun to relax. Spa Illuminata had kindly arranged lunch for us so we relaxed in big comfortable chairs, still in our dressing gowns and checked out the menu of fresh and healthy sandwiches, wraps and salads. I opted for a simple ham sandwich with handmade crisps while Jenny had a fruit smoothie and a chicken wrap with handmade crisps. 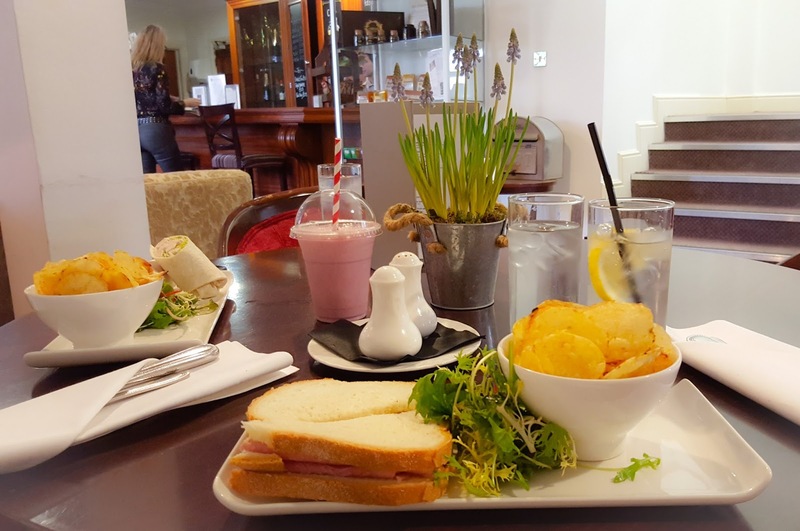 The lunch was lovely and I have nothing but praise for the staff who were attentive, polite and enthusiastic, not just to us, but to everyone. I think it's always key when reviewing somewhere to take note of how staff react to everyone around - not just the bloggers who they know are reviewing the experience! After lunch we were offered a glass of Champagne whilst we relaxed on the sofa's with our Kindle's before our treatments. Of course we managed about 1% reading and 99% talking but a big gossip was definitely needed. 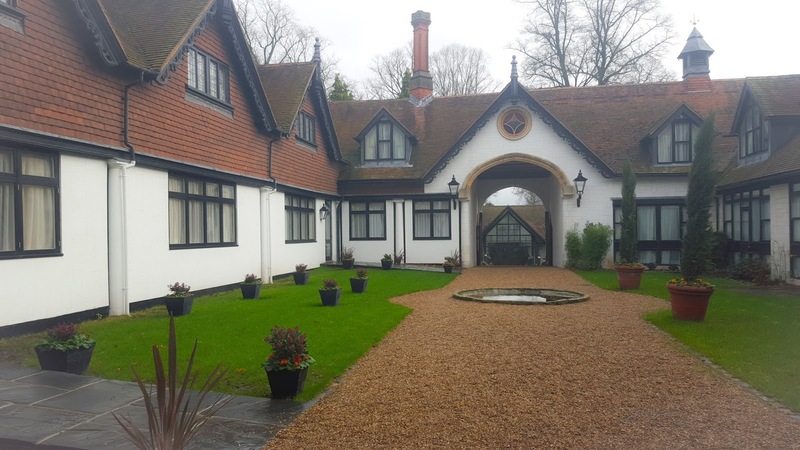 We were then taken into the VIP suite to experience the Spa Illuminata Danesfield House Trilogy Treatment. 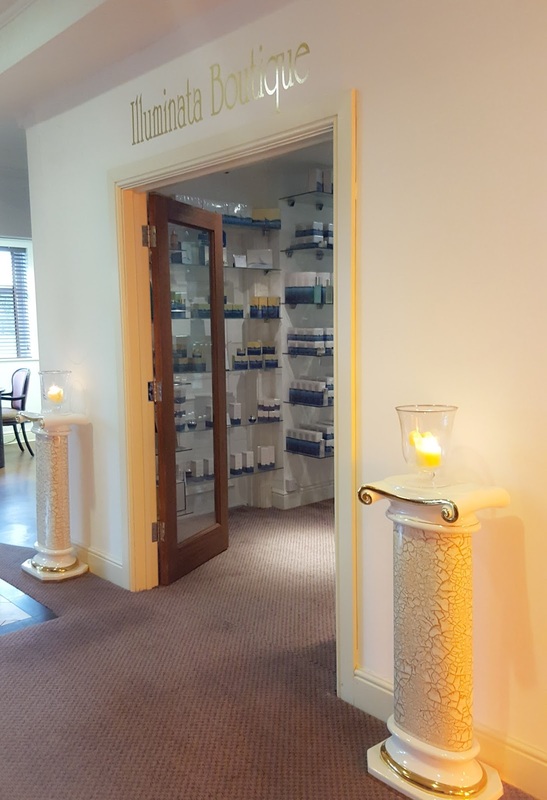 The treatment lasted 80 minutes and includes the following: A deep cleansing back exfoliation followed by an Aromatherapy Associates hot stone back massage bringing powerful de-stressing benefits to mind and body. This all-embracing treatment is then completed with a bespoke, La Vallée Facial. My skin was feeling extremely dry and dull thanks to the horrible winter weather and my lack of holidays/sunshine in the last year so I was in desperate need of a facial. I've never had a treatment over an hour before so was worried it was going to be too much but it definitely wasn't. Jade was my therapist and I can thoroughly recommend her for being friendly, polite, professional and proficient. I haven't heard of either of these brands before so I'm looking forward to researching them further. After our treatment, Jenny and I were taken to their post treatment relaxation room. There were big chairs with duvets (heaven!! ), fruit and drinks and dimmed lighting. I definitely need one of these rooms in my house! We spent some time in there before one last visit to the steam room and jacuzzi before we unfortunately headed home. 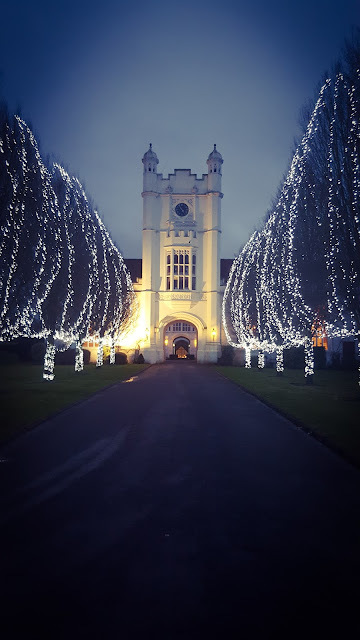 I can honestly say the staff at Danesfield House Spa Illuminata are a massive credit to them. Their customer service is as exceptional as the spa itself which together makes a hotel spa, a pure indulgence, a destination and most importantly a luxuriously relaxing treat. If you're staying at Danesfield House then you will get access to the spa but if you're looking for a day spa treat, you can visit the Spa Illuminata at Danesfield House or their award winning venue in Mayfair. Find out more about Spa Illuminata here. 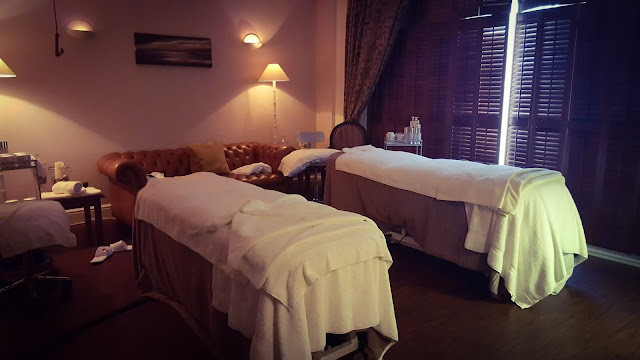 As Mother's Day is quickly approaching, I would highly recommend the Mother and Daughter Spa Day package which includes the Spa Illuminata Danefield House Trilogy treatment which is what we had, as well as a Jessica Manicure or ZenSpa Pedicure, a two course lunch and use of the spa facilities from 9.00-17.00. 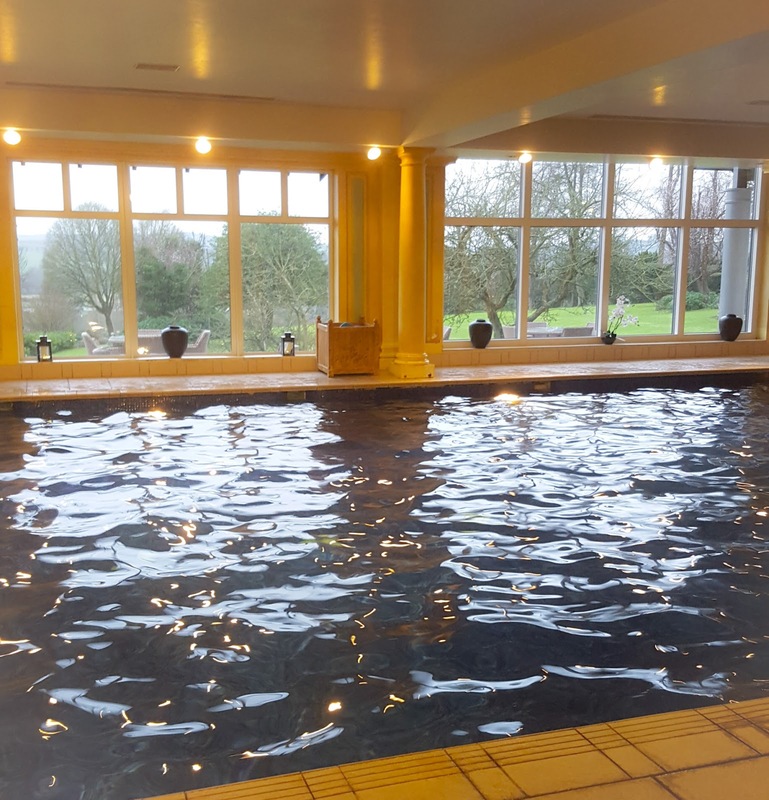 You can find out more about the Danesfield House Spa Day Packages here. Thank you to Danesfield House and Spa Illuminata for the most wonderful experience. sounds like the perfect day! 80 mins of pampering is incredible, I WANT! It looks amazing!! I love a good spa day, and this place literally looks heavenly. It looks lovely there. 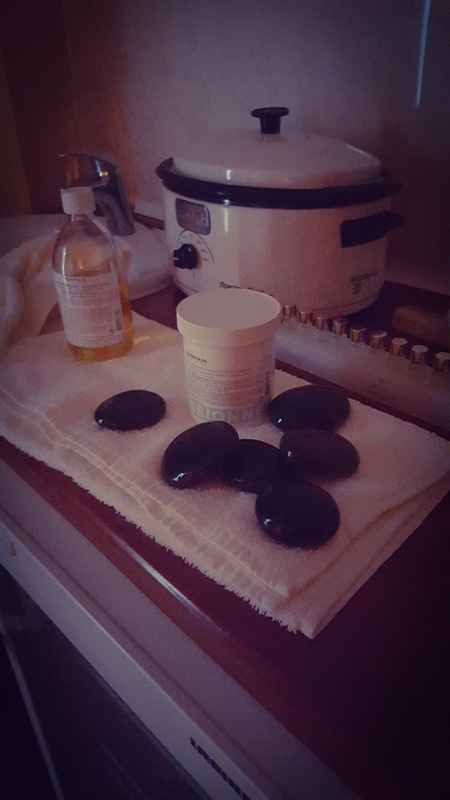 I would really like a hot stone massage right now.